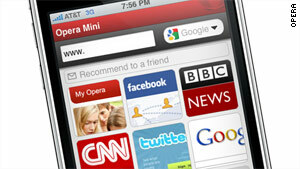 Opera submitted its Mini smartphone Web browser to the Apple store on Tuesday. Tech watcher on wait for Apple's decision: "This is going to be good"
(CNN) -- Web browser company Opera has submitted an app for the iPhone that it promises will make surfing on the device faster -- if Apple allows it. The Norwegian company said Tuesday morning that it has handed over its Mini smartphone browser for consideration by Apple's App Store. The announcement came after a months-long promotional campaign and will test Apple, whose Safari software is the iPhone's default browser. Apple has had a widely acknowledged practice of denying apps that compete with features already on the phone. Opera demonstrated the iPhone app -- which it claims will be up to six times faster than Safari in loading some Web pages -- at the Mobile World Congress in Barcelona, Spain, in February and at the South by Southwest Interactive festival this month in Austin, Texas. "The Opera Mini for iPhone sneak peek during MWC told us that we have something special," said John von Tetzchner, co-founder of Opera Software, in a written statement. "Opera has put every effort into creating a customized, stylized, feature-rich and highly responsive browser that masterfully combines iPhone capabilities with Opera's renowned Web experience, and the result is a high-performing browser for the iPhone." Apple, located in Cupertino, California, did not immediately respond to a message seeking comment early Tuesday morning. In the smartphone market, Opera currently is available on BlackBerry, Windows Mobile, Palm and Android platforms. Opera Mini also runs on the Symbian platform and is huge on non-smartphone mobiles, accounting for many of its more than 50 million monthly users worldwide, according to the company. But the company clearly covets the iPhone's devoted and active user base. At South by Southwest, Opera spokesman Thomas Ford told CNN that his company's very public rollout hasn't been an effort to pressure Apple into approving the app. But the company is calling attention to its showdown with Apple over the mobile browser. On Opera's Web site, there's a page with a ticker showing, up to the second, how long it's been since the company submitted its app to Apple. While the Apple store has never approved a Web browser that renders results without relying on Safari's inner workings, Opera maintains the two are different enough. The company says Safari is better for complicated Web functions, while Opera specializes in quickly opening basic Web pages. If approved, Opera Mini would not replace Safari on iPhones but would give users who downloaded it a choice between the two browsers. Opera has not announced pricing for the app, although Mini is free on other phones. Anticipation in the tech world over how the showdown will shake out had already ramped up Tuesday morning. "Whatever happens, this is going to be good," said writer Thomas Ricker on the tech blog Engadget.